Good Job Mr. President! You Got Into Bed With Big Labor and Lost The Senate In The Process. I can’t wait to hear the all too expected excuses and explanations from leaders of the democratic party as they crank up the blame game. They’ll blame Martha Coakley’s campaign staff for running a lousy campaign. They’ll blame Martha Coakley for making the race about personalities. They’ll blame the voters for not understanding their message. The President, himself, said the election had largely become one of local issues. Hell, it wouldn’t surprise me to hear Press Secretary Robert Gibbs blame alien intervention. The democratic powers that be in the House and Senate will publicly go along with all of this folderol, though privately they are concerned. Not one of the nationally prominent democrats will speak the truth, as it is apparently easier to remain in lockstep with Obama, than it is to be honest. I’ll tell you the truth. Obama promised transparency but that was just a lie. Obama promised an end to earmarks but that was just a lie. Obama promised to get special interests out of the White House but that was just a lie. Obama promised no tax increase for the middle-class, but that was just a lie. I could go on, but I’m tired of typing. This president has been exposed as a liar and the American people aren’t going to stand for what Obama and Congressional Democrats have been so arrogantly dishing out. They tried forcing Cap and Trade, trillions in stimulus spending and health care reform which is being thoroughly rejected by the American people. They – very arrogantly – don’t care what we think, after all, they as masters of the universe, clearly know what’s best for us. Thankfully, we have the Tea Party Patriots, the 9/12 Project and countless other fine organizations to thank, including big labor unions. Labor, you say? Yes, labor. When Andy Stern, President of Service Employees International Union, said that SEIU had spent more than $60 million getting Barack Obama elected, Obama responded by relieving union members of the Cadillac Tax on health insurance premiums that he proposes the rest of us pay, it was clear that a quid pro quo had been reached. 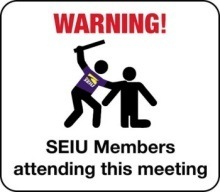 Andy Stern and the rest of the SEIU thugs have, in fact, bought themselves a president. The beat down that Scott Brown put on Martha Coakley was a rejection of the president’s socialist policies and a rejection of the man’s character, which we have found to be sorely lacking. Andy Stern may have bought himself a president, but he got a lame duck. The American people really did have a great deal of hope when Obama swept into office, but he has shattered it by lying to us. So, as candidate Obama pointed out, Americans can’t afford their own lobbyist in Washington. Thankfully, we don’t need our own lobbyist, Mr. President, the Tea Party is very ably shouting you down with all of our voices. This socialist President is done. As Ronald Reagan told us, the world’s second oldest profession does bare a remarkable resemblance to the oldest. If you disbelieve anything I’ve said remember this. The average margin of victory for democrats in the last four presidential elections has been 35%. Yesterday, the bluest of blue states elected a Republican Senator. Thank you voters of Massachusetts. Thank you Tea Party Patriots and Senator Brown; welcome to the Senate.